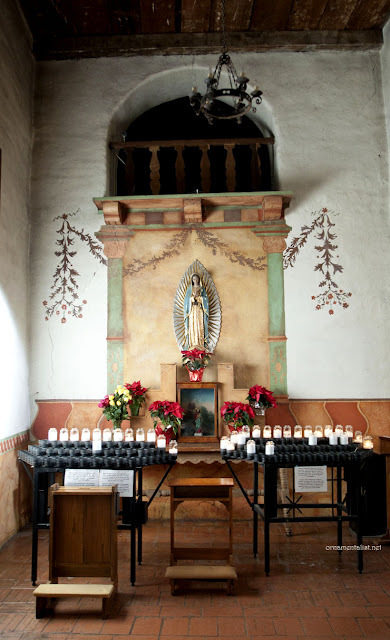 Driving up Highway 101 along the coast of California, you will see a lot of signs for "El Camino Real" and often a curved post with a bell attached. 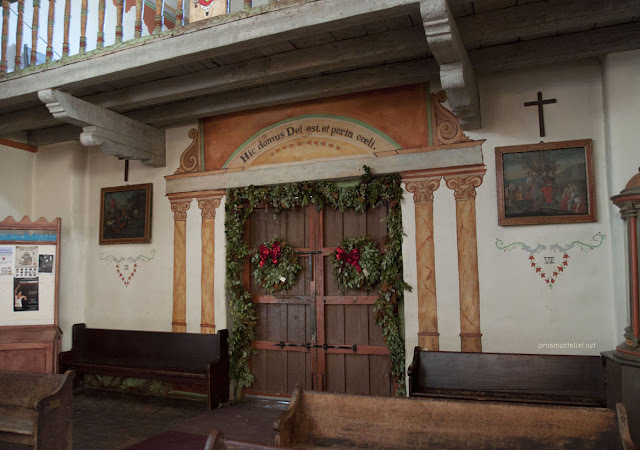 These bells indicate the old Mission Trail, which connects a series of 21 Franciscan missions built in Alta California in the 18th century. We decided to stop at a couple of these missions on our way back to San Francisco. And I had my camera with me. Originally built in 1791, the chapel and one wing of the original quadrangle were completely restored in 1955, and the chapel still has the original title floor. Painted ornament of the most basic configurations decorate the chapel at Mission Soledad. The effect is whimsical, rich, serene. Growing up in California I took for granted the "Mission Revival" style of architecture which dominated late 19th and early 20th century development. 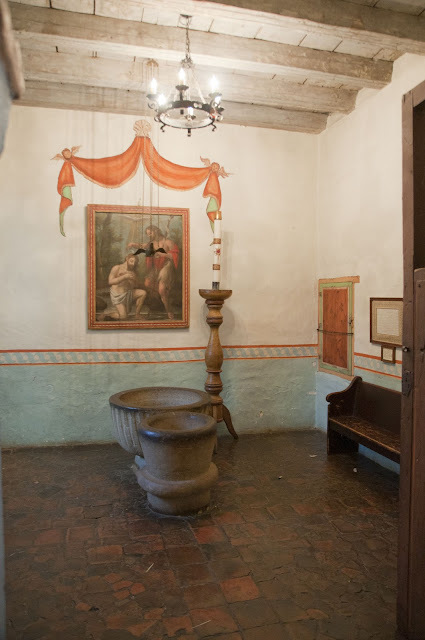 But when you walk around a real mission, features like beamed ceilings, corredors, giant iron candle holders, and deep-set windows make a lot more sense. 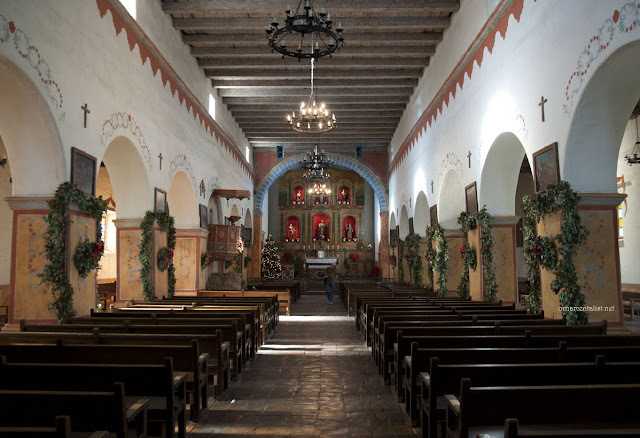 The nave of San Juan Bautista, the largest of the California Missions. 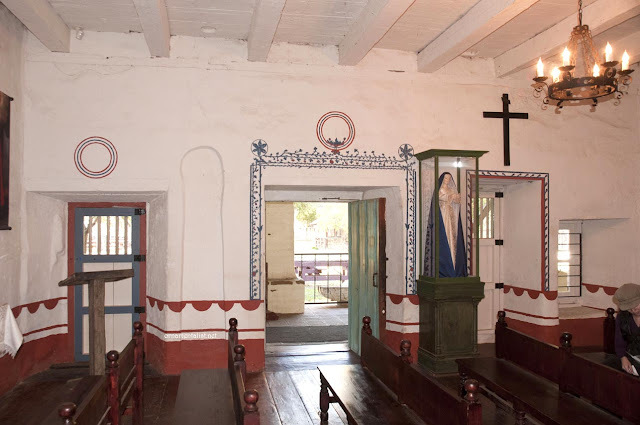 Built in 1797 directly above the San Andreas fault, the largest of the California missions has survived a number of earthquakes. Much of the original structure remains, and the church has been fairly recently restored. 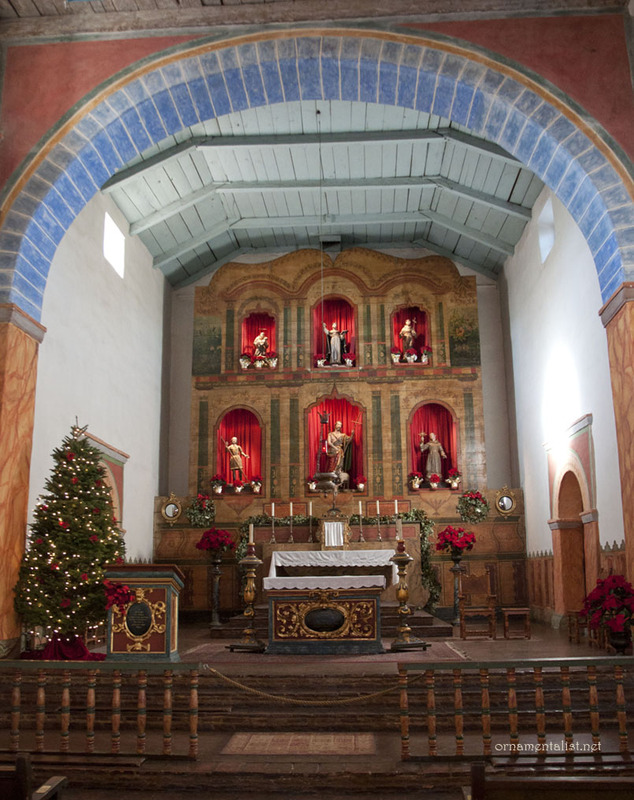 The interior was painted originally by Thomas Doak, and American sailor and carpenter who had jumped ship in Monterey, and who decorated the reredos in 1817, in exchange for room and board. The back of the church with its simple trompe l'oeil columns. "This is the House of God, and the Gate to Heaven"
The outer walls collapsed in 1976 and were rebuilt within a few years. 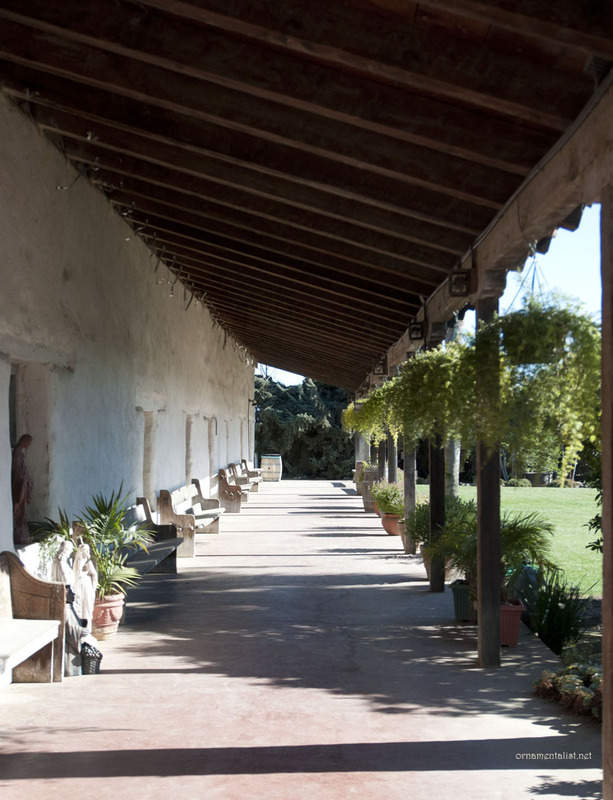 Since the mid-1990's restoration work has been carried out Dr. Ruben Mendoza and the students of CSU-Monterey Bay. And done rather nicely I have to say! 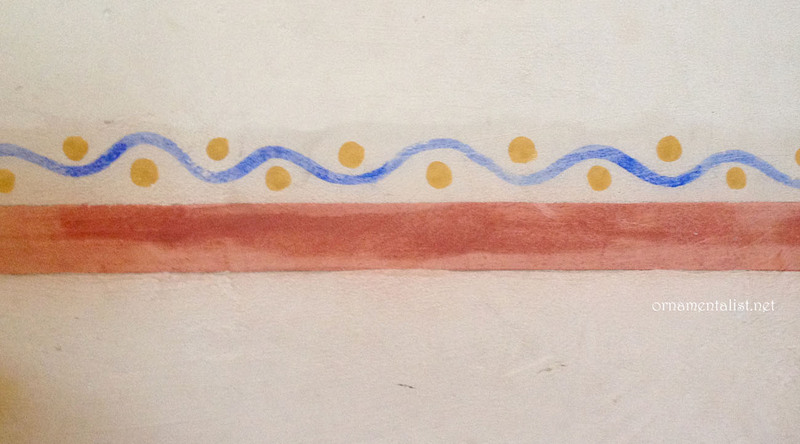 This simple guilloche border is used throughout the church in different colors. 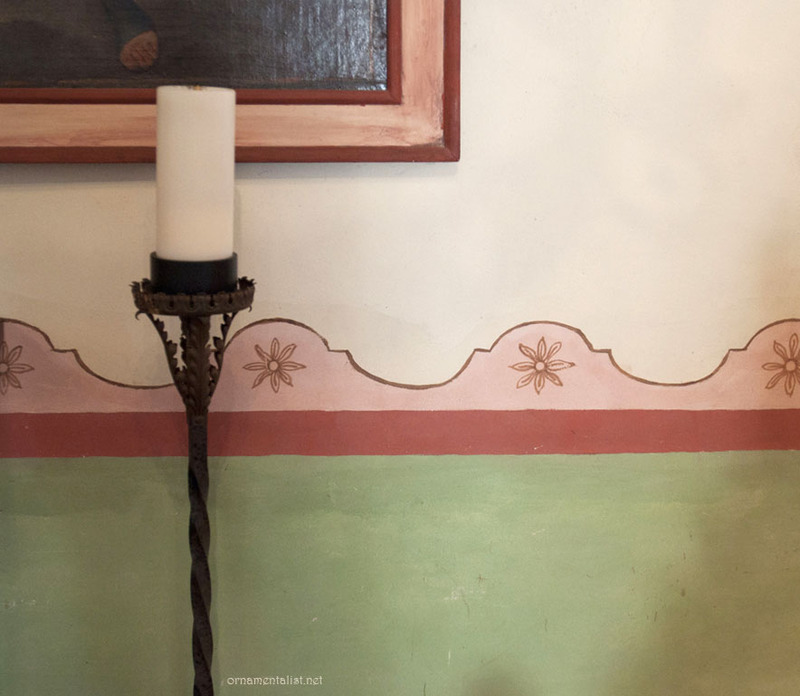 The simple ornamentation as well as the color schemes I find very inspiring and really quite useful. I have no idea what the banner over this door is supposed to mean. Do you live near an old mission? 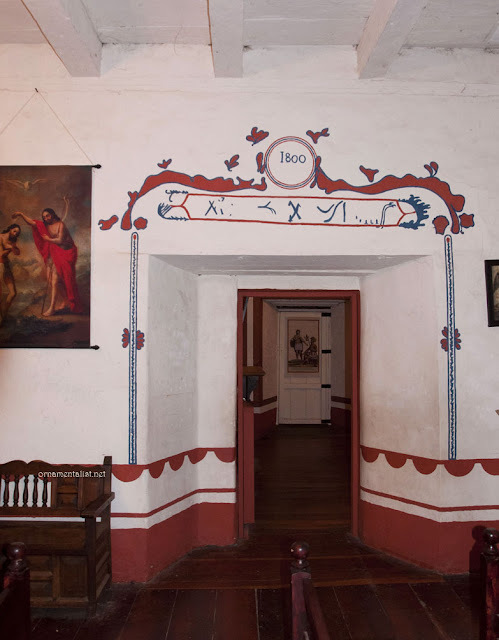 I am reminded now to revisit my local: Misión San Francisco de Asís. all photos in this post by Lynne Rutter December 2011. 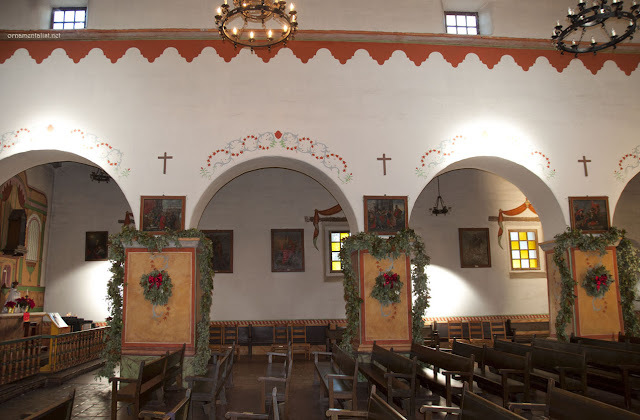 I have been in several of the California Missions; this one is truly special! The ornamental painting is superb! Thanks for these terrific pics.. 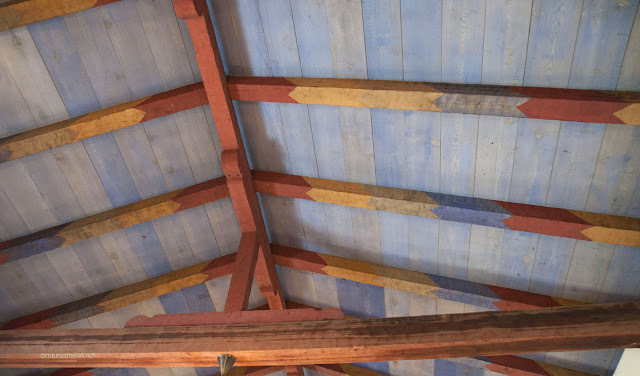 I didn't know how beautify these early Spanish churches are - really inspiring colour, texture and pattern! thanks for visiting, Karena and Annie! Hi, Lynne — I'm so glad you had your camera with you! I'm really taken with the beams of the Soledad chapel. Somehow they remind me of the classic gradated angel wings. Have a happy, healthy new year. I contacted you a while ago about using some of your lover's eyes photos and have since loved following your blog. I can't tell you how much I love this post. 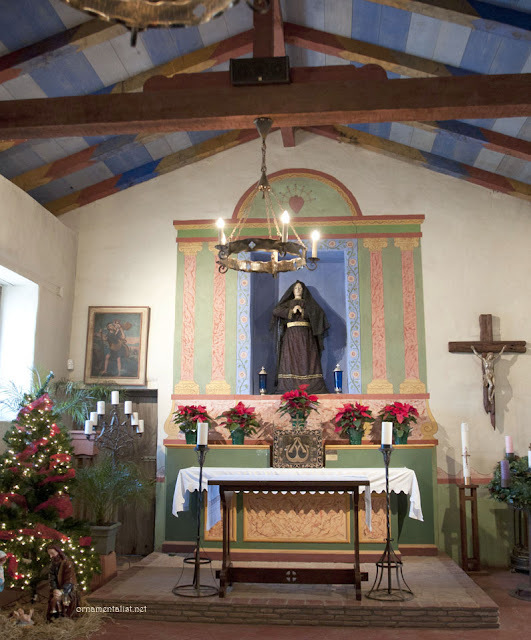 After the insanity of the holiday season, to sit and study the beautiful,simple use of color and form, in the peaceful sanctuary of the missions, literally slowed my heart rate down. Ahhh... I may just sit here and stare at the images for another hour....if I can do so without my family finding me and someone calling out "Mom, where's the ....(fill in the blank)??!!!" Thank you, thank you and best wishes for the new year. 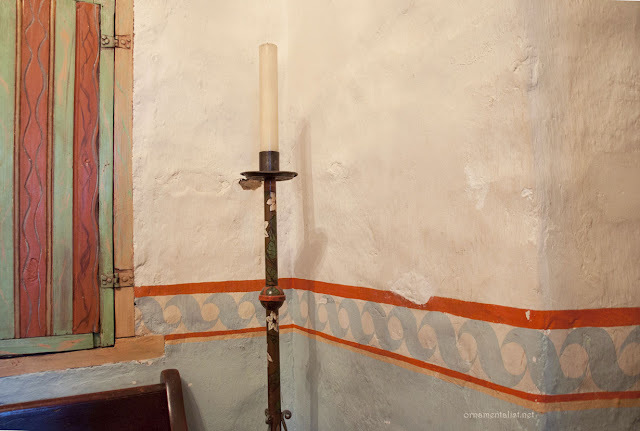 Mark, there may actually be a correlation- in my experience no decor in a church is without some symbolic connection. HCH I am glad you enjoyed this, imagine how calming being in the space is! Great pics, Lynne! I find it ever so inspiring to see photos of original art, done by passionate folks. We don't have anything like the West coast missions here in Ohio, so seeing these is a visual treat for me for sure. hi Ann, we are constantly reminded here that California has a very different history than the rest of the US, being part of Mexico and before that Spain, and before that, wild untouched native American land. English as a language (or culture) was not common here until relatively recently. Hi Pascal, I too find the ornament exotic, but the placement of it very familiar. 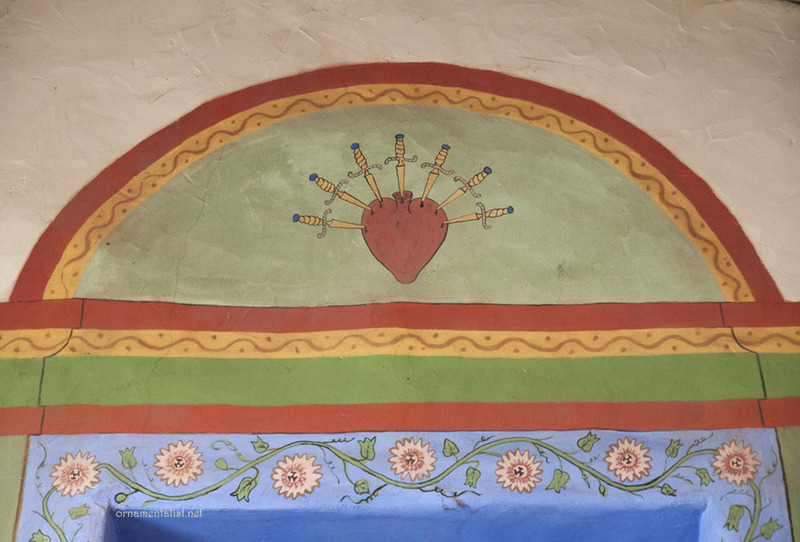 I think the designs were influenced by the native artists and the locally available pigments. And where indeed would art be without patrons? The Catholic Church understood the value of a beautiful space. at least, they used to.